We asked the respondents to make recommendations for other states interested in using Medicaid to fund services in residential care settings, based on their experience doing so in their own state. 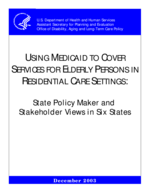 The majority of recommendations related to assuring a method to pay for room and board for low income persons, assuring adequate funding, and recognizing that different licensing and more restrictions are needed to serve the Medicaid population, particularly those who meet the criteria for a nursing home level of care. Figure out what affordable really means, both for the Medicaid eligibles and for low and moderate income folks. For Medicaid make room and board affordable first. You can't make it work for large numbers of low income people and Medicaid eligibles without subsidies for room and board.